A long weekend with 15th Aug falling on Friday was fast approaching. My favorite region Lonavala was still looking unpromising prospect for trekking due to tourists flocking on the weekends bringing traffic to a grinding halt. In contrast, Junnar region, truly a paradise for trekkers with hardly any crowd was beckoning once again and a plan for Nimgiri fort along with Narayangad was finalized on 16th Aug and few whatsapp messages a group of five was formed comprising of Amol Chandurkar (my colleague in office), Sameer Kadam and Chinmay Kirtane (my regular trek mates) and my elder brother Tushar Kothawade (who gradually is becoming a habitual trekker). So a long weekend was set - 15th Aug for family; 16th Aug for trekking and 17th Aug for rest and family. Friday 15th Aug dawned and with the spirit of patriotism in air, I along with my wife and son set out to rather unplanned hike to Tikona Fort. It was going to be first real hike for my son Arnav (5 yrs old) and we all were equally excited. It turned out to be an amazing day with lots of rain and Arnav truly enjoyed his first hike; at times, he even guided us how to hike on slippery patches. Saturday 16th Aug; other two forts were waiting for me. But things didn't start well in the morning when we were pounded by rain when we started our journey from Pune to Junnar. Rain lashing the windowpanes of the car, puddles oozing with water and sign of deluge on the road made the heart skip a beat and I began to doubt whether trek on the unknown fort with heavy rains was really a wise decision. Luckily, when we neared to our breakfast joint near Manchar, intensity of the rain lessened and weather was back to normal much to our relief. After munching on the delicious snacks, we headed towards Junnar. My longing to capture a photo of Shivneri with statue of Shivaji Maharaj was finally fulfilled when I asked specifically to stop the car just to capture this photo. Soon, we were on our way to Nimgiri. Along the way, we passed Leopard Rescue center and Manikdoh dam. Monsoon magic had really done wonders to the whole landscape and every nook and corner of the nature had turned into a verdant carpet. In few days time, Hadsar fort also bore the look of green carpet and it was a sight to behold. Finally, after a hiatus, rain god had finally pleased the farmers and there was a surge in the farming activities. Though, we had planned Narayangad as our second hike of the day, we just did not want to hurry just for the sake of covering the second fort and were enjoying each and every moment of our travel till Nimgiri. Chavand Fort was standing prettily behind the backwater of Manikdoh dam. A joy surged through us when twin forts of Nimgiri and Hanumantgad along with Tiwai Pinnacle (pinnacle seen on the right) appeared before us. Automatically, a car came to a halt, cameras were out and few photos were clicked. We were greeted by villagers when we reached to the base. After parking the car and exchanging some pleasantries, villagers showed us the hiking trail and we started our hike in a fantastic weather. As soon as we started our hike, a kid started walking in front of us. We had not hired him as a guide but still he was accompanying us. After walking for some distance, we realized that there were few confusing routes and the local kid accompanying us proved to be blessing in disguise. We tacitly accepted this kid as our guide and started following his instructions. Along the way, we came across a huge tree succumbing to the heavy rains and probably its old age blocking our path and we had to take some alternate route to join to the main trail again. After walking for about an hour, we came across few villagers descending with heavy load on their heads. Staying in the vicinity of the mountains has its own pros and cons. Staying in nature provides a lot of pure joy to the soul but body goes through a lot of hardships to earn even the smallest of the things so easily available in the cities. Soon, we spotted few caves carved in the vertical rock face of the mountains. This place is known as Ghodyachi Paaga. Sweeping views of the entire landscape made us hooked to this place for quite a sometime. After spending few blissful moments in the cave, we resumed our hike and immediately came across broken steps which looked very slippery and difficult. Fortunately, there is a route that bypasses these broken steps and join them somewhere in the middle after which climbing is relatively easy. The route bypassing the steps passes through the col between Nimgiri and Hanumantgad Forts and you get some breathtaking views of the western side of the fort. After soaking in some beautiful views, we resumed our hike and soon joined somewhere in the middle of the steps which were slippery and we had to be cautious on each step. A large plateau of Nimgiri was carpeted with lush green grass. Few cattle, shepherd with mountain ranges on the backdrop provided a perfect frame for my one of the treasured photos from this hike. It started drizzling when we came across a small temple (without any cover). Intensity of the rain increased and we ran for a shelter in the caves. There was a stench of cow-dung coming from the caves but still, we went inside to explore and take shelter from the rain. It was still raining and stench of cow-dung was becoming unbearable and we came outside and visited top most point of the fort. Innumerable white flowers provided feast to the eyes and we made sure to capture few photos though it was raining. At last, our exploration of the fort was complete and we decided to descend. Descending was more difficult from the slippery steps and we had to be very cautious on each and every step. 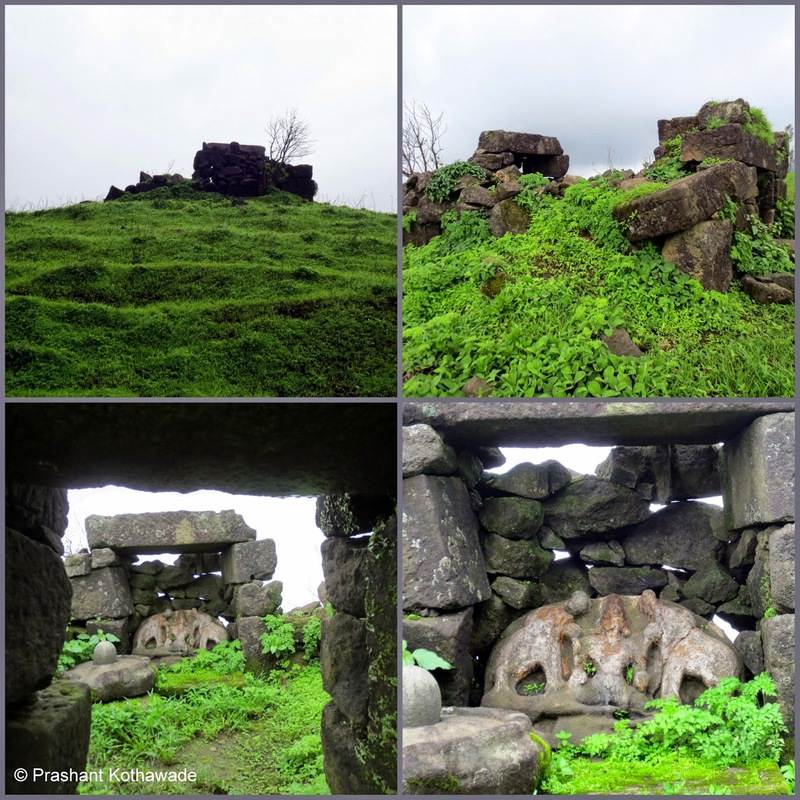 There are some cisterns on the adjacent fort Hanumantgad but we decided to skip that part of exploration as we were not carrying lunch and we still had not given up the hope of visiting Narayangad. 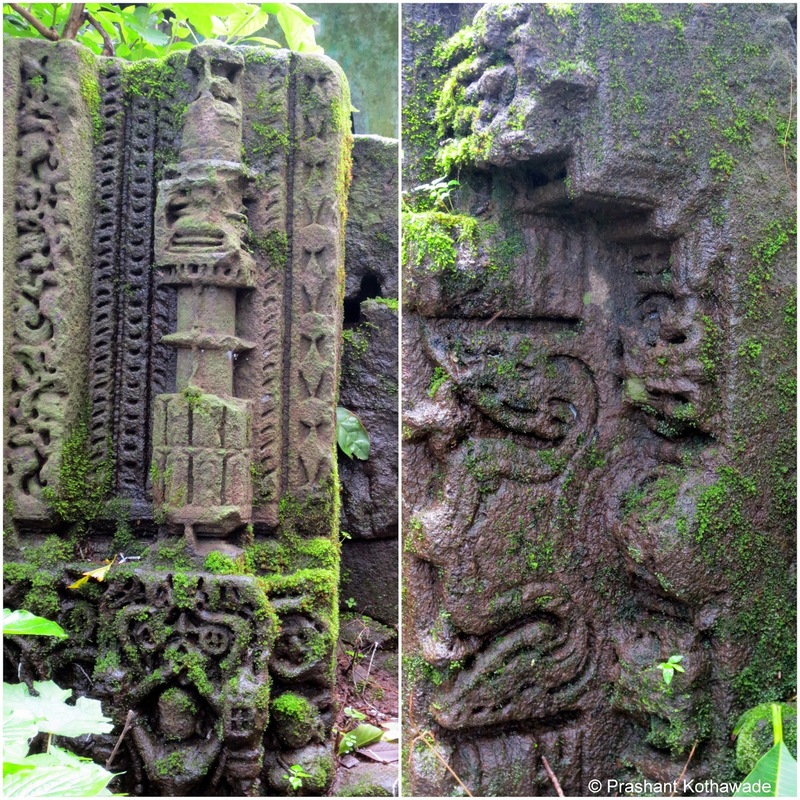 Soon, we reached near to the base and was happy to see some idols carved in the rock tucked away in the bushes which we had missed during our ascent. Our guide then took us to a temple which was on the left side of the ascent and was not visible because of the dense vegetation. Our guide was proving to be a blessing in disguise; otherwise we would have definitely missed visiting the temple. After spending few minutes in the temple premises, we headed towards our car but not before passing through the thick forest. After getting refreshed and handing over some money to the kid, we left Nimgiri village and headed towards Junnar for lunch before proceeding to Narayangad, our next destination. Overall, the hike to Nimgiri turned out to be a picturesque one. Approach to the base village was equally scenic. Twin forts - Nimgiri and Hanumantgad carpeted with verdant grass made an everlasting impression. Stunning views of the surrounding mountain range covered in the clouds from the col provided immeasurable satisfaction. Overall, a day well spent amidst the scintillating nature! Special thanks to "Onkar Oak" and "Nikhil Margaonwar" whose inputs helped me plan this hike perfectly. This hike can be combined with Shivneri, Hadsar, Sindola or Narayangad. If you have only a day to hike and want to cover two forts in a day, choose any one of the above options. Hire a guide as there are some confusing trails. No food facility available on the fort. Ideal would be to have the packed lunch or go back to Junnar for lunch. If neither is possible, put order at base village before you start the hike. Beware of the broken and slippery steps if you are hiking in rainy season. Thanks Sam! Yes, greenery throughout the trek has made photos more appealing! Thanks Chinu! Trek mate like you made this trek more memorable! Awesome efforts Prashant. You must have spent a lot of time writing these blogs. I stay in Thane but I would like to join you on treks in future. That's if my age is not a issue. I am 55 now and were bit out of touch for some time. Recently did 3 small treks to Matheran and feel ready for more challenges. Thank you so much Vilas sir! Sure, you can join me if you are confident about your fitness. I have seen people over age of 55 fitter than those in their 30s. So please join me whenever you can. Please add me in your facebook friends' list and ping me whenever you want to trek with me. Beautiful photography...reading blog was likely to feel treking there.. Thanks Amruta! I welcome you on this blog. Thanks Aashish for your comments! I have added you on my facebook list and we can be in touch and trek together. Saw couple of posts from your blogs and loved those. Keep writing and keep trekking! Wow photography and writer is rare combination. I would like to join you for next event please call or whats me. My no is 9619668996. Thanks Sachin. I will get in touch with you soon. Hi Prashant. Great work. We 2 guys are planning to do Jivdhan, Naneghat, Chavand and Nimgiri this Aug. Aug 15 falls on Monday so its a long weekend. So planning to cover the above in 2-3 days. Any tips/suggestions on our plan.